Melbourne Black Lives Matter rally held in solidarity. 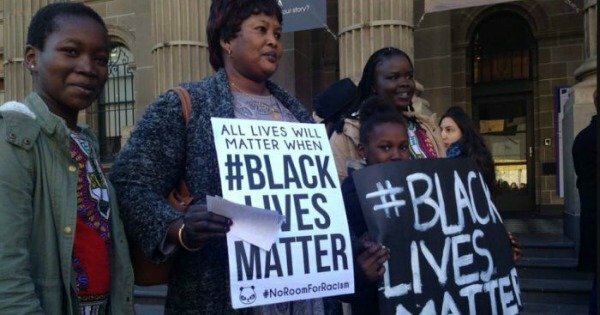 #BlackLivesMatter: Rally held in Melbourne to show 'solidarity' after US racial violence. About 3,500 people have gathered in Melbourne to show “solidarity” to the Black Lives Matter movement, following a recent outbreak of racial-fuelled violence in the United States. Crowds gathered on the stairs of the State Library of Victoria about 12:00pm amid a strong police presence, including the riot squad, but the march was peaceful. Organisers said the march was in support of the Black Lives Matter movement in the United States, which gathered momentum following a number of fatal shootings involving black Americans and police. The death of Alton Sterling in Louisiana and Philando Castile in Minnesota, both at the hands of officers, triggered a wave of protests over police treatment of minorities. Anger over the shootings was believed to be the reason behind the killing of five white police officers during a protest in Dallas. Organisers said the Melbourne march was "a peaceful rally in solidarity with our brothers and sisters across the Pacific" to show that "all lives matter". They also said it highlighted the deaths of Indigenous Australians in custody. One speaker at the rally told the crowd: "People say to me &apos;Get back on the boat&apos;. I didn&apos;t come here by boat, I came here by Qantas." "There is only one race, that is the human race," he said. The march was then led by mounted police along Swanston Street to Federation Square and staged a sit-in outside Flinders St station.